All proceeds will go to victims of Hurricane Katrina. 20 x 26 screen print poster from the 2005 Hurricane Katrina Benefit Concert at Radio City Music Hall. 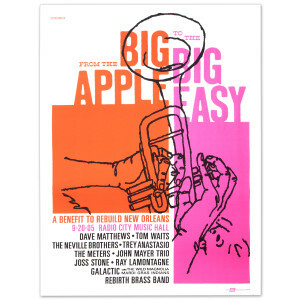 Poster features Dave Matthews, Tom Waits, The Neville Brothers, Trey Anastasio, The Meters, John Mayer Trio, Joss Stone, Ray LaMontagne, Galactic, and the Rebirth Brass Band.